Take advantage of the many white sales going on now. 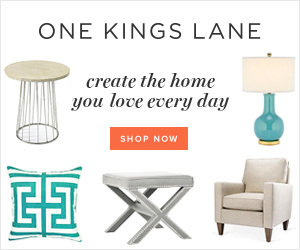 Treat yourself to a new sheet set or update a room with new throw pillows or blankets. 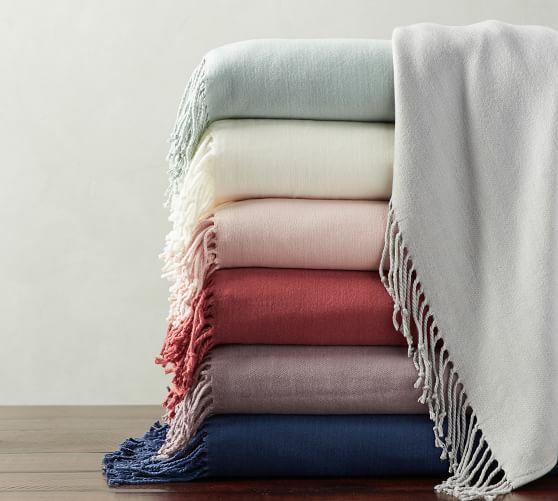 I absolutely love these fringed blankets*. 2. 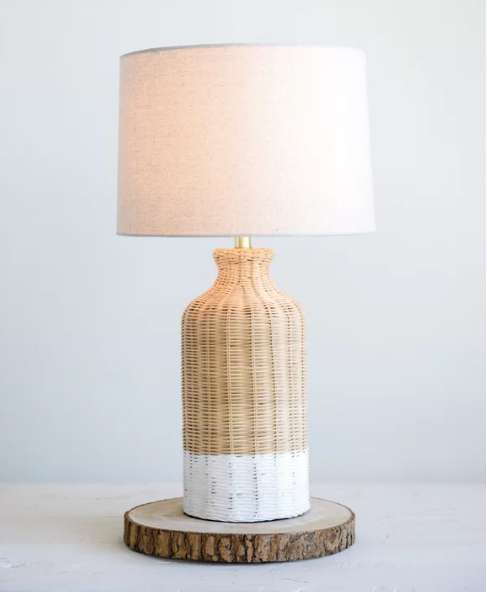 Replace an outdated set of lamps with something new, like this cute wicker lamp shown below. You can also try something as simple as changing your lightbulbs, the right bulbs can drastically brighten up a room. I love the GE Reveal bulbs for their pure white light, no yellow casts from these, you’ll be amazed at the difference! 3. 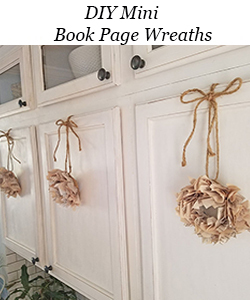 Adding greenery or flowers is my favorite way to brighten up any space. Sometimes I’ll grab a bunch at the grocery store because there’s nothing like the real thing, but I’m also loving the selection of artificial flowers and greenery available these days. 4. Last weekend I ordered a new slipcover for my sofa. 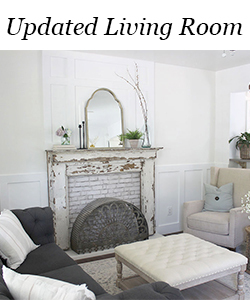 I have the Pottery Barn basic slipcovered sofa in my family room and decided to lighten things up with a white one. 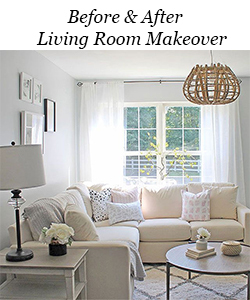 Changing out the color of the slipcover will make you feel as if you got a whole new couch. 5. Getting organized doesn’t require spending much if any, money. 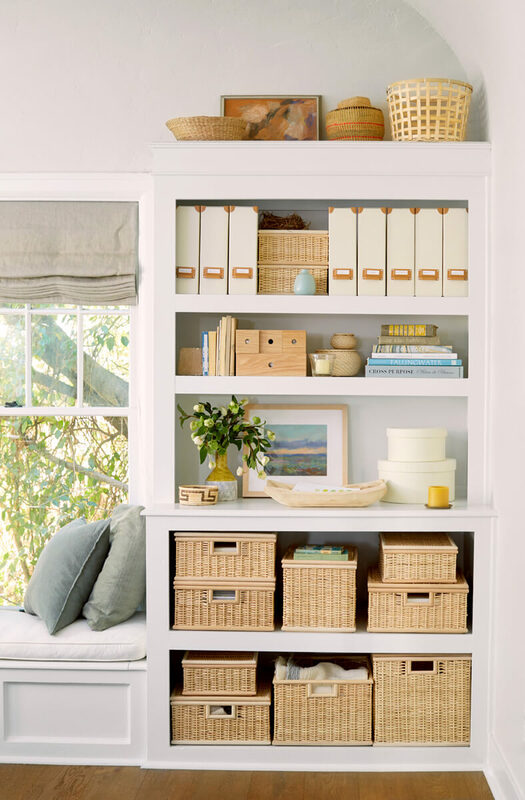 Organize your bookshelves, I especially like the light colored baskets used here, they’re so pretty paired with white. I found similar here that I’m thinking of ordering myself for shelves in my daughter’s room. 6. 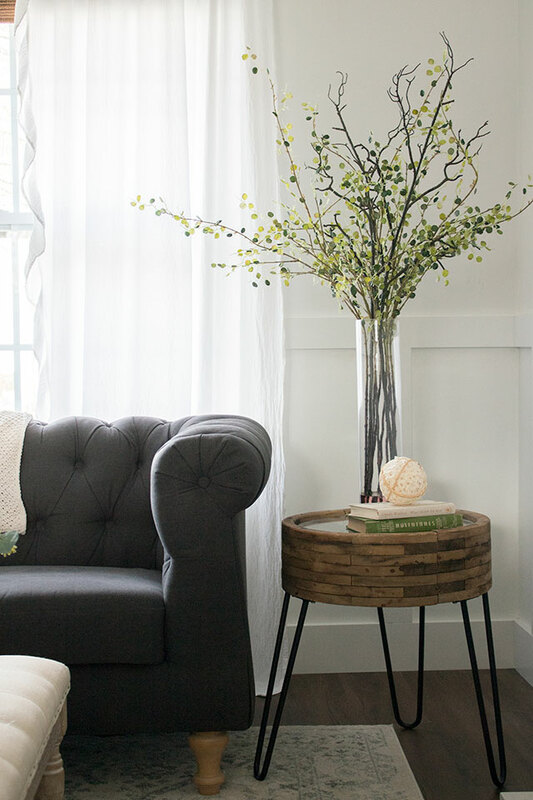 Swap out small pieces of furniture like a side table or coffee table. 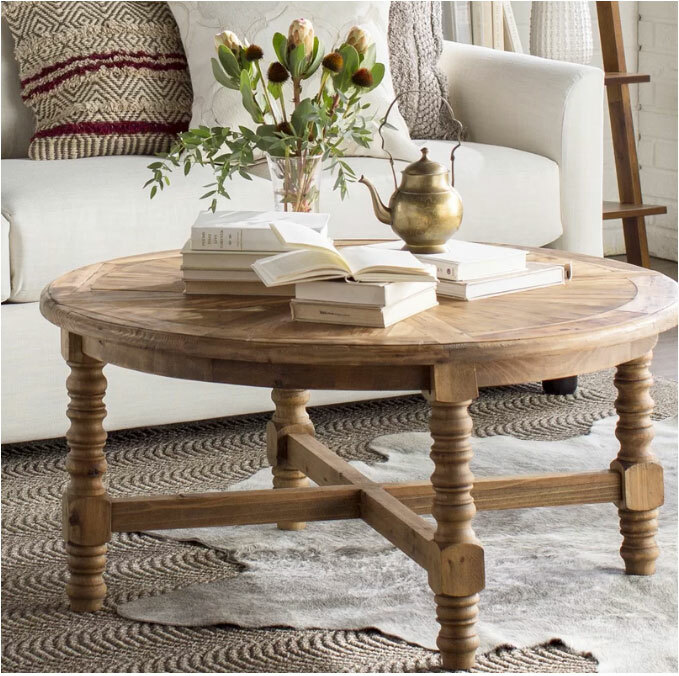 I really love the finish on this round wooden coffee table. 7. 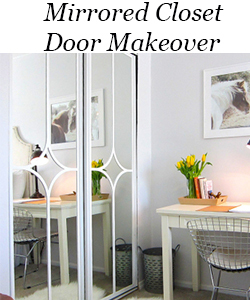 You could also paint a piece of existing furniture that may be feeling a bit outdated. 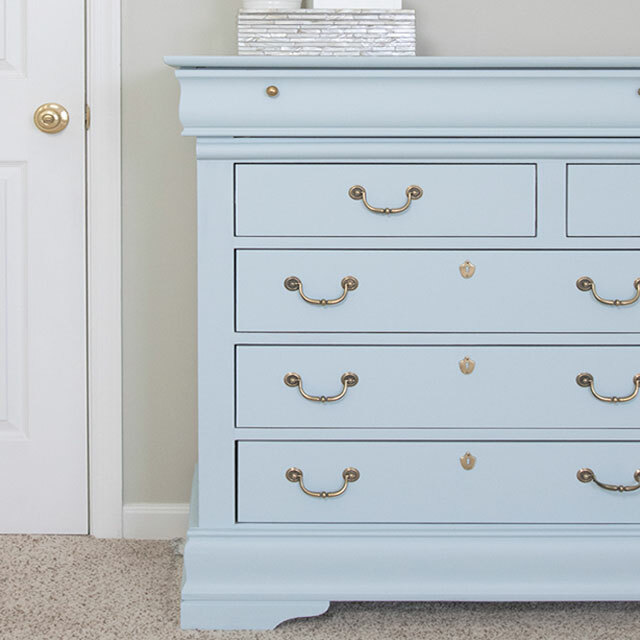 The blue paint used on this dresser makeover is like a breath of fresh spring air! 8. 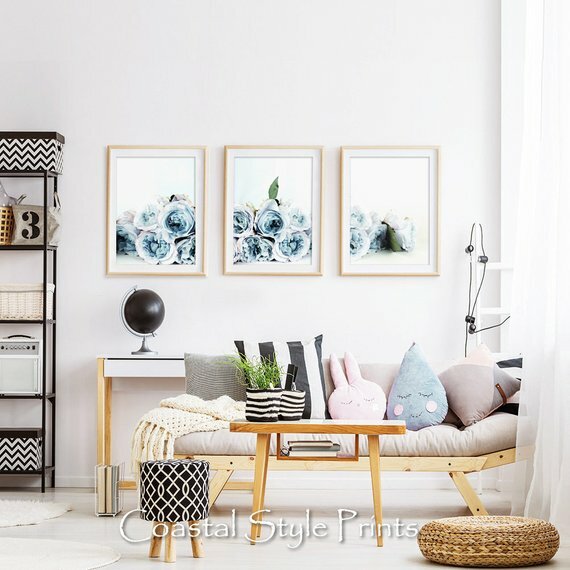 Change up your wall decor – this set of blue floral prints is under $20 total, and you can download them immediately. 9. 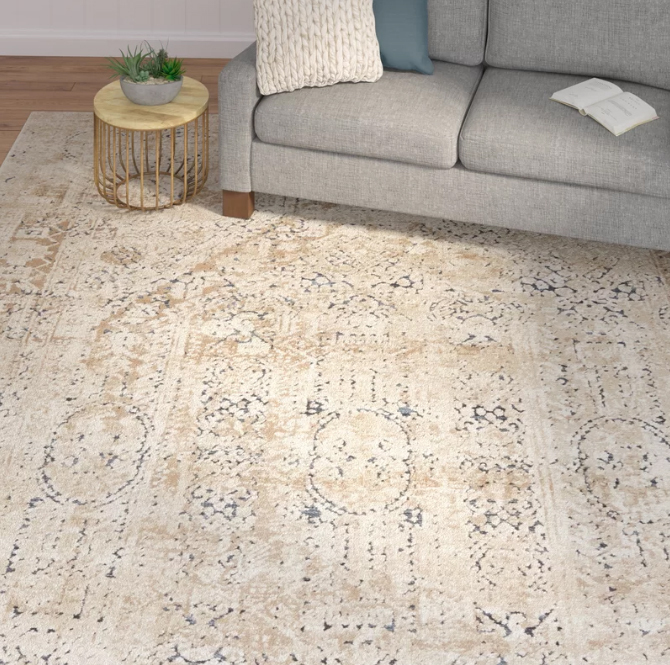 Introduce a whole new color scheme with an area rug. 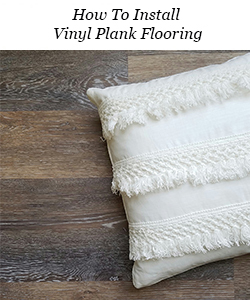 Find an area rug you love and base the rest of the colors in your room from that for a no-fail color pallet. 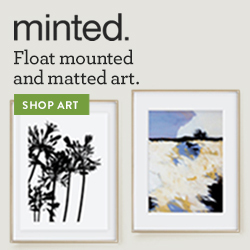 What do you do to liven up your space during the long winter months? Great ideas for us this time of the year. 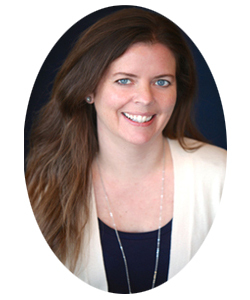 Thanks for this post and new ideas for very little cash. You’re welcome, Mary! Glad you enjoyed it! HobLob is having a sale on greenery so I picked up a few room brightening stems today. Loooove those PB throws!